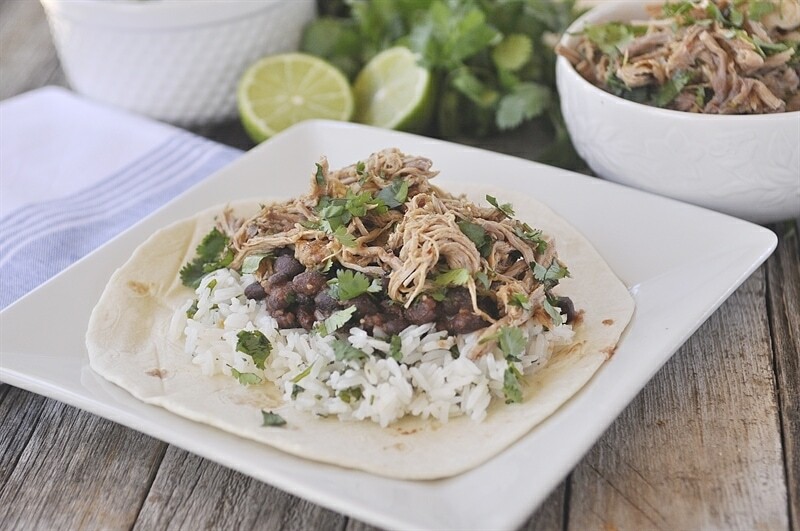 Slow Cooker Shredded Chipotle Pork is full of flavor and so versatile! You can use it for all kinds of things. Happy Monday! 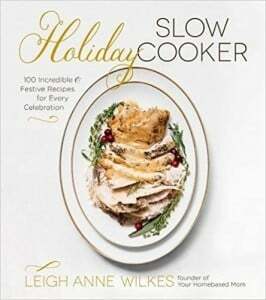 It’s gotten to be quite the tradition around here, sharing a slow cooker recipe on Mondays. 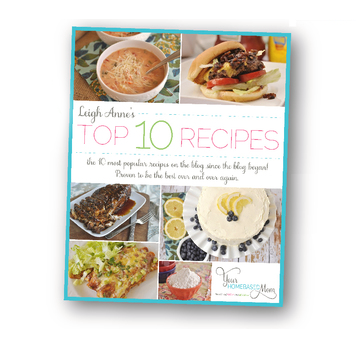 I think I will do a few more slow cooker recipes and then for the summer we may switch it up and do easy summer and grilling recipes. What do you think? 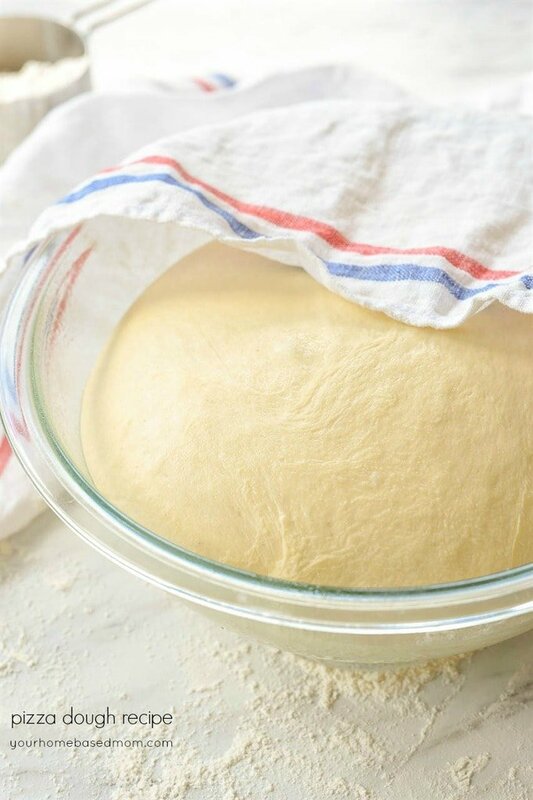 There are several things I really like about today’s recipe. 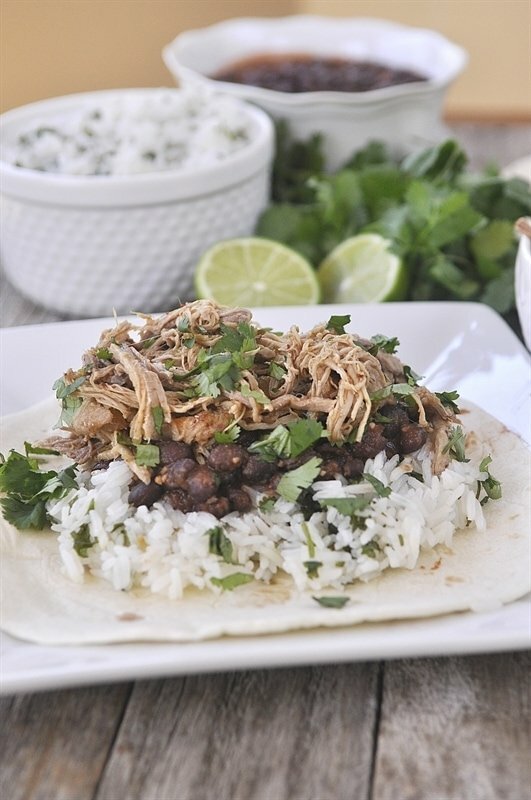 It has great flavor thanks to chipotle peppers and it is so versatile. 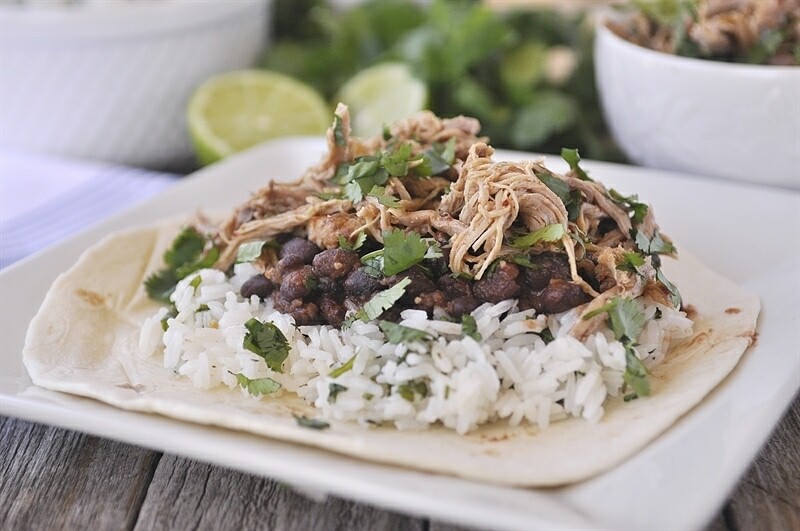 The pulled pork can be used so many different ways. I like to just serve it over rice for one. It can also be used in burritos, tacos, enchiladas, quesadillas, etc. 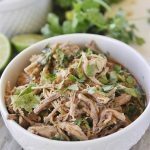 I served this slow cooker shredded chipotle pork this week when I had the missionaries (19 year old boys) from church over for dinner. I had heard they were big eaters so I was prepared. This recipe makes a good amount and it was plenty for four of us, with two being big eaters! In fact there were plenty of leftovers for my husband for several days. 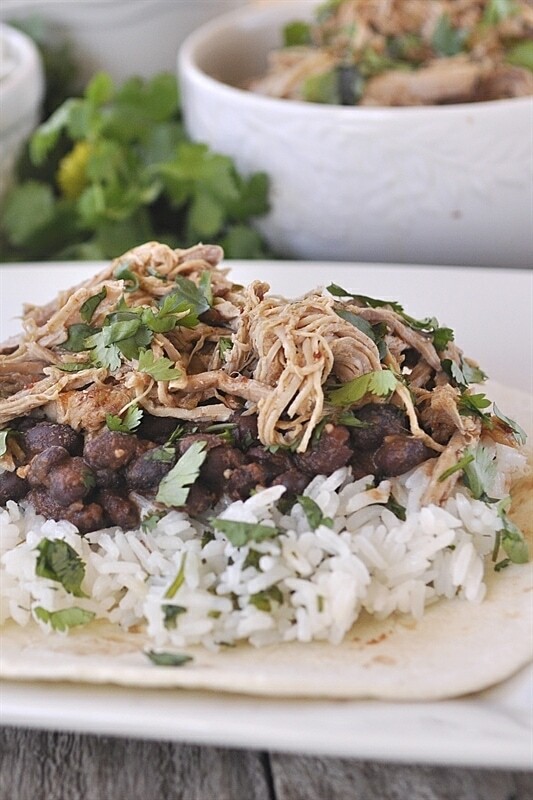 I made some Cafe Rio Black Beans and Cilantro Lime Rice and let them make their own burritos with all the fixings. When I told them I was a food blogger and the recipe would be on the blog they wanted me to make sure and tell you they gave it two thumbs up! The recipe called for Chipotle Sauce which I couldn’t find so I just blended up some canned chipotle peppers and used that. It worked great. 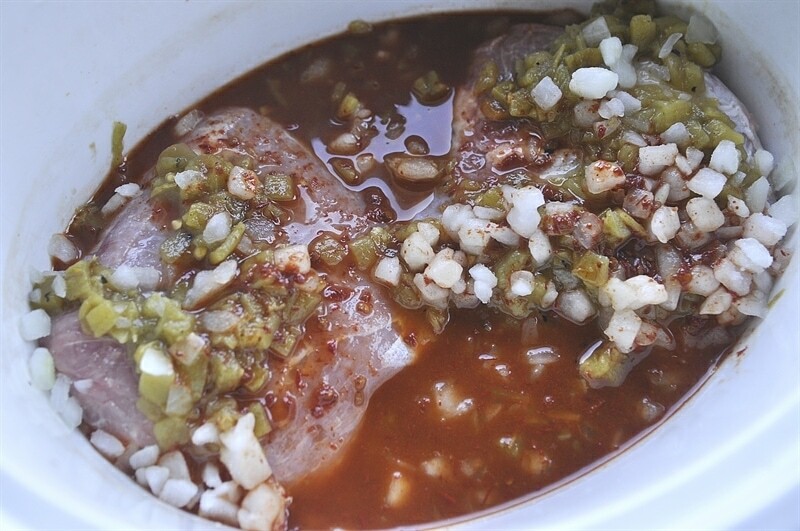 I placed the pork into the slow cooker along with green chilies, onions, garlic, lime juice, chipotle sauce and some water. Cook it on low for 6-7 hours and then remove the pork and shred it. 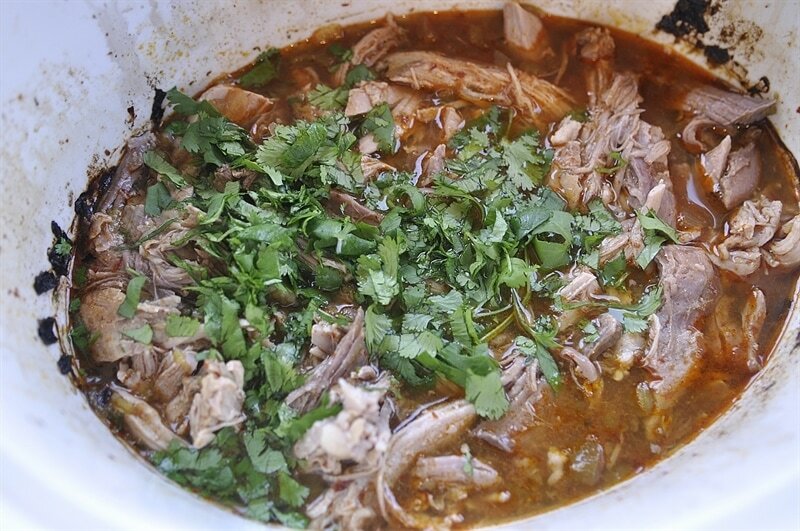 Put it back in the pot along with some cumin and fresh cilantro and allow it to simmer in the slow cooker for another 30 minutes to allow the meat to absorb some of the juices. Then serve it up however you like! 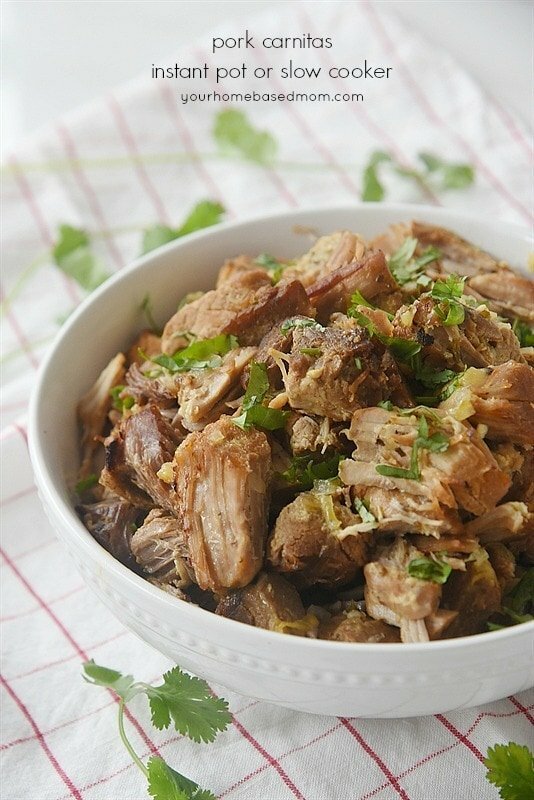 Place pork in slow cooker and season with salt. Add in chile peppers, lime juice, garlic and onion on top of pork. 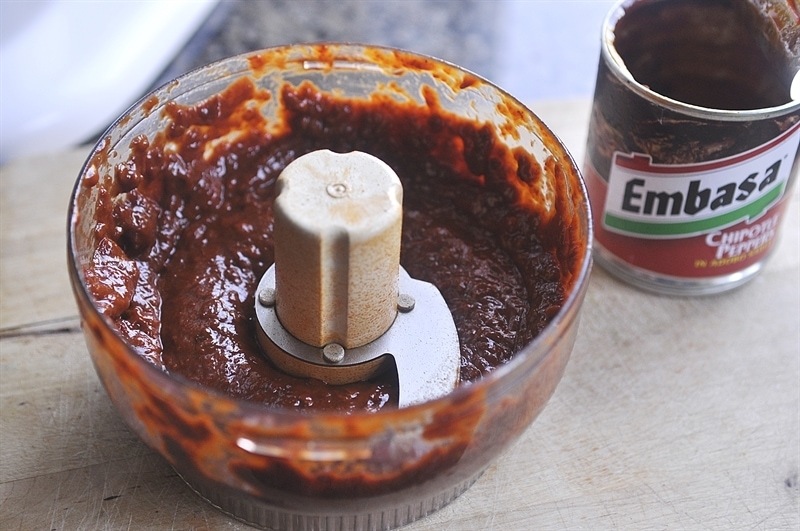 Mix together chipotle sauce and 1/2 C water, pour over pork. Cook on low for 6-7 hours until pork is tender and easy to shred with a fork. 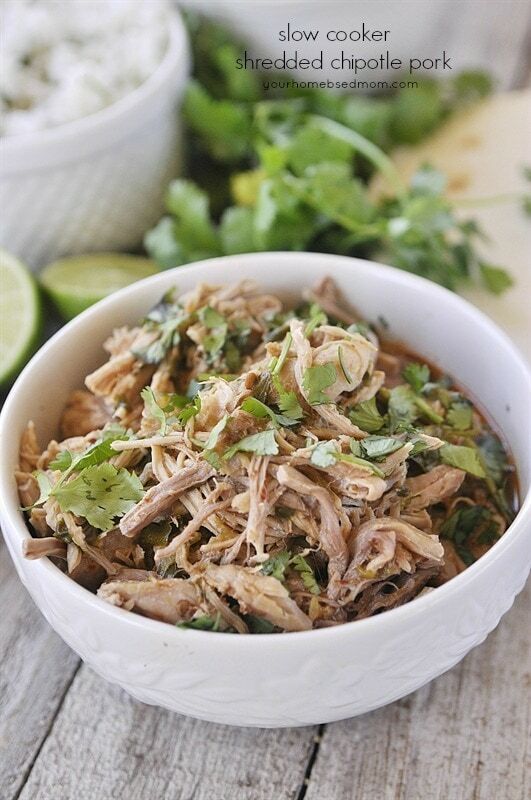 Remove pork and shred with a fork, place back into slow cooker. Add 1 1/2 tsp cumin and 1/2 C chopped cilantro. Stir and allow to simmer for about 30 minutes giving the pork time to absorb some of the juices. Serve as a burrito, taco, enchilada etc. 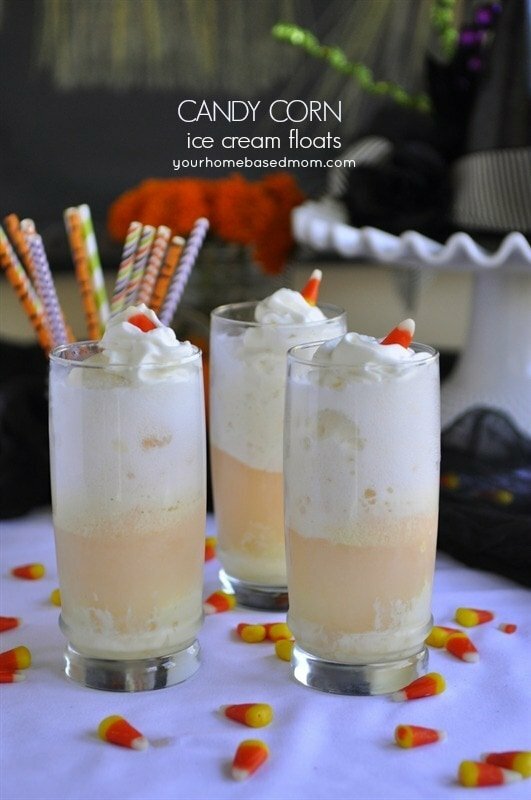 Looks tasty and easy to make. I did notice you said “I placed the chicken in the crock pot” in the middle of the instructions (when you meant to say, “pork”), but I think chicken would work (and I happen to have some in the freezer), so I am going to try it. Deb, oops, you are right. I’ve got that corrected, thanks It would be good with chicken too, just won’t need to cook as long. 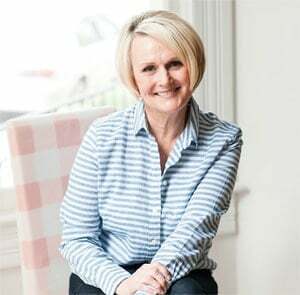 Thank you Leigh Anne for the nice recipe and have a great Monday. Bridget, You can definitely control your heat by the amount of chilies you add. 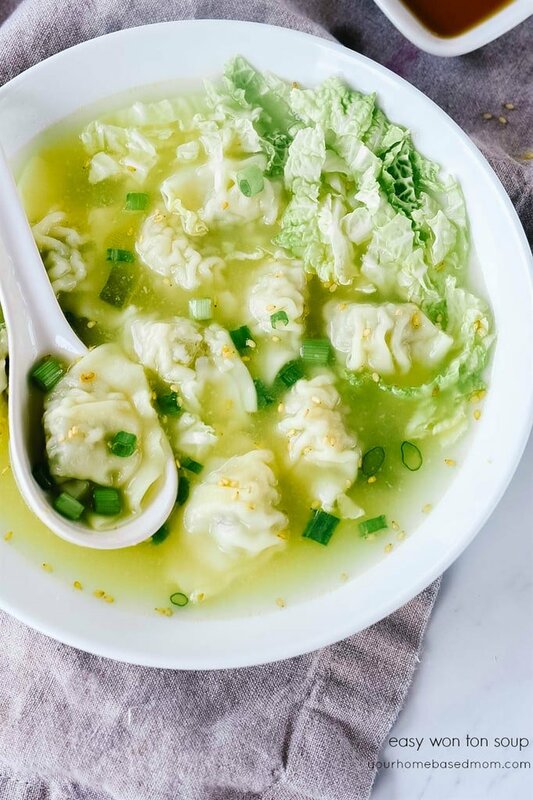 You could just add in a tsp of the juice so you get the smoky flavor and not too much heat. Where does the lime juice come in? Not in your instructions. Sorry about that, it is in the instructions in the post but left it off in the recipe. I have updated the recipe. Thanks.